Industrial Ethernet Market size in 2016 was estimated to be over USD 20 billion and is anticipated to grow at around 15% CAGR over the forecast timespan. The industrial Ethernet market is set to witness an extensive growth due to the rising adoption of the Industrial Ethernet protocols among the industry verticals. As the industry verticals are getting automated very rapidly, the requirement for an efficient communication network that connects all the components also arises. This drives the demand for Industrial Ethernet protocol to establish a scalable, flexible, and ubiquitous network. Furthermore, the development of more cost-effective devices and the increasing demand for switches are also estimated to have a significant impact on the growth of the market. The growing adoption of the Industrial Ethernet in the automotive sector also fosters the market growth. The software used in the average car is becoming more connected and complicated. The different systems and modules in the automotive are required to increasingly interact with the one another, driving up the bandwidth requirement in the automotive. Consequently, OEMs are integrating more computer-based systems, connections, and applications to ensure proper connectivity between systems. This significantly increases the cost, complexity, and the weight of wiring harnesses and the wiring harness becomes the third highest heaviest and costliest component in the cars. It can significantly reduce the complexity and the cost of wiring in the automotive by providing a single network for connecting all the systems via a central switch. The increasing infrastructure spending and the rising requirement to enhance the network flexibility and performance are the major factors that are driving the growth of the industrial Ethernet market. However, the requirement to comply with a wide array of protocol and standards when implementing the solutions along with the security issues associated is a major constraint. TCP/IP is the most commonly integrated protocol. It is a suite of communications protocols used for interconnecting network devices over the internet. TCP/IP can even be used as a communication protocol in the private network. The protocol is widely used in industrial automation, robotics, machinery, and related industrial operations. The communication takes place through real-time Ethernet or Fieldbus interface. Some of the widely used real-time applications of TCP/IP Ethernet include File Transfer Protocol (FTP), Simple Mail Transfer Protocol (SMTP), Post Office Protocol, Telnet Protocol, Internet Access Management Protocol (IMAP), Border Gateway Protocol (BGP), and NetBIOS Session Service. Switches accounted for majority of the industrial Ethernet market share in 2016 owing to their advantages over commercial switches in terms of the ability to operate in harsh industrial environments. Also, the switches have redundant power inputs to ensure the maximum uptime. They offer full bandwidth to eliminate the issues of network determinism. Managed Ethernet switches, also known as intelligent switches, offer superior control capabilities and are used in applications that require network segmentation or traffic monitoring and a high bandwidth. 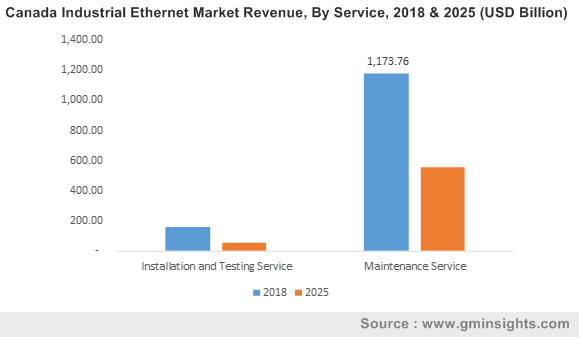 Installation and testing services dominated the industrial Ethernet market service space in 2016 owing to their large-scale adoption for facilitating successful and reliable implementation of the technology in industrial environments. As the initial implementation requires the installation of different hardware components such as switches, media converters, firewalls, communication interfaces along with their integration with the pre-existing network infrastructure, specialized expertise is needed. The service providers enable effective installations and integrations with legacy systems ensuring long-term stability of networks. Also, these services ensure the functional testing of cables and the assessment of network and bandwidth performance, minimizing the possibilities of errors due to incompatibility issues. The industrial Ethernet market is mainly driven by applications such as automotive & transport, electrical & electronics, aerospace & defense, energy & power, oil & gas, and chemical industries. Government initiatives for modernization and extension of power generation and distribution infrastructure and the adoption of IIoT for industrial Ethernet market applications to facilitate industrial automation in sectors, such as automotive and electronics, are expected to accelerate the market growth. Growing demand for high-capacity data transmission solutions due to rapidly increasing data traffic will also support the industrial Ethernet market growth between 2017 and 2024. Electrical & electronics sector held a major share of the global industrial Ethernet market in 2016 owing to the large-scale adoption of network management devices such as switches, routers, hubs, and power supply devices. As these devices ensure effective implementation, management, and security of the network, their demand has experienced a significant increase over the past five years. The adoption trend in the oil & gas industry is expected to increase significantly over the forecast timeline for effective management of functions such as offshore drilling, well head monitoring, onshore operations along with monitoring, and control of pumps. North America held a major share of the global industrial Ethernet market in 2016 owing to the significant contribution of switches and routers in the revival of the manufacturing industry in the U.S. post the 2008 recession. Protocols such as EtherNet/IP, PROFINET, and SERCOS III have played a major role in modernizing factories and advancing them to the next era of manufacturing. As the industries in the region are focusing more on process optimizations and network upgrades to secure a competitive advantage, the industry demand in North America is expected to increase steadily over the forecast timeline. The Asia Pacific Industrial Ethernet market growth is largely driven by rapid industrialization in countries including India, China, and Japan owing to the increasing demand for the industrial automation solution in the region. Furthermore, the increasing adoption of IIoT solutions and the growing adoption of the solutions among the organizations for flexibility, scalability, and to reduce the cost of operation are the major factors fueling the market growth. The players operating in the industrial Ethernet market offer complete solutions that include field level devices, communication protocols, and system integrations to enhance their customer base and profitability. Cisco, ABB, Rockwell Automation, Siemens, Schneider, Beckhoff Automation, ACS Motion Control, Advanced Motion Control, Honeywell International, Omron, Eaton, Innovasic, and Moxa are some of the major vendors of the Industrial Ethernet market solutions. The major strategic initiatives include partnerships and collaborations with automation solution vendors to enhance the portfolio and gain prominence and in the industrial automation sector. For instance, in 2017, Rockwell and Foxconn announced that they have signed an agreement to implement industry-leading IIoT solutions at Foxconn’s consumer electronics assembly operations. The Industrial Ethernet market growth is attributed to the growing adoption of IIoT for enhancing the productivity of production functions in various industrial sectors such as automotive & transport, electrical and electronics, oil & gas, energy & power, and aerospace & defense. With growing awareness toward better integrating factory-installations and IT systems across these industries, the demand for advanced solutions are likely to accelerate between 2017 and 2024. In terms of new installation of nodes in factory automation functions, Industrial Ethernet has overtaken traditional fieldbuses, with Ethernet/IP emerging as the leading network installed across industries.